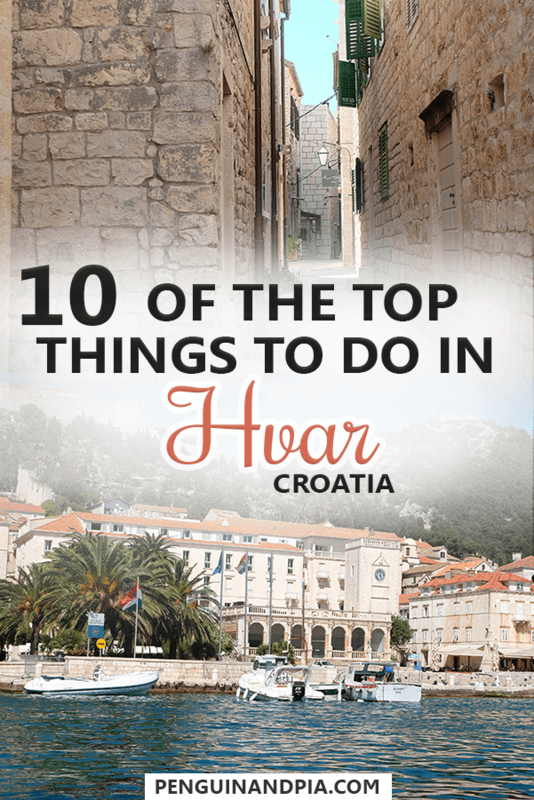 Here are 10 Things to Do in Hvar, Croatia! 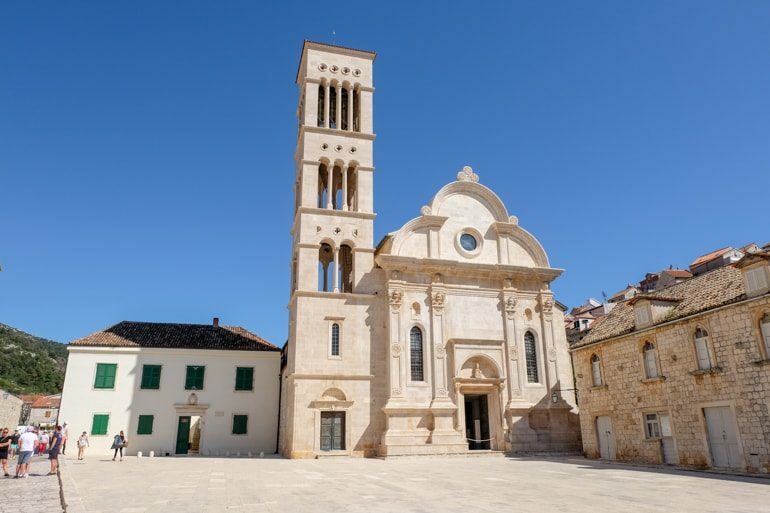 Let us guess – you’re looking for things to do in Hvar blog post and you’ve stumbled across this one? Maybe? Yes? Well, in any case, we are glad you are here. We lived outside of Split for a few weeks while travelling around the Balkans in early 2018 so we had the great opportunity to explore the area. The Croatian islands are always a popular destination and we’re happy we can provide some information on Hvar. Lots of people want to check out the nightlife in Hvar. Of all the clubs, Veneranda comes to mind – and there are certainly many more ideas in that department! If you’re travelling as a couple, you might even be looking for romantic things to do in Hvar. We have a suggestion for that one, too! 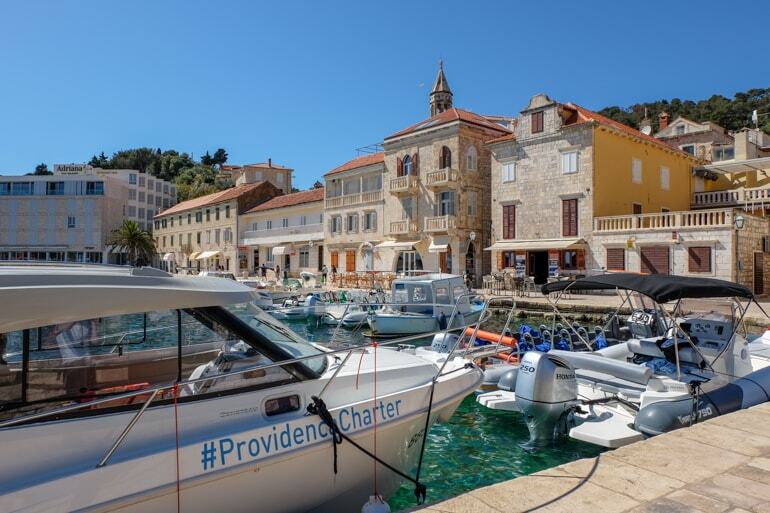 So, whether you’re in Hvar for a few days or looking for what to do in Hvar in one day, here are a few of there things that you can do and see when you’re in Hvar! Trying to get to Croatia? We took the bus from Podgorica to Split through Montenegro! Carrying on in your journey? Here’s how you get from Split to Sarajevo in Bosnia & Herzegovina! Heading to Dubrovnik? Here are a Few Top Things to Do in Dubrovnik! Unlike many other travellers we had met, we didn’t spend too much time in Hvar (the town). We know lots of people that took the ferry from Split but we had booked our place on the mainland. We ended up in Hvar almost by accident. 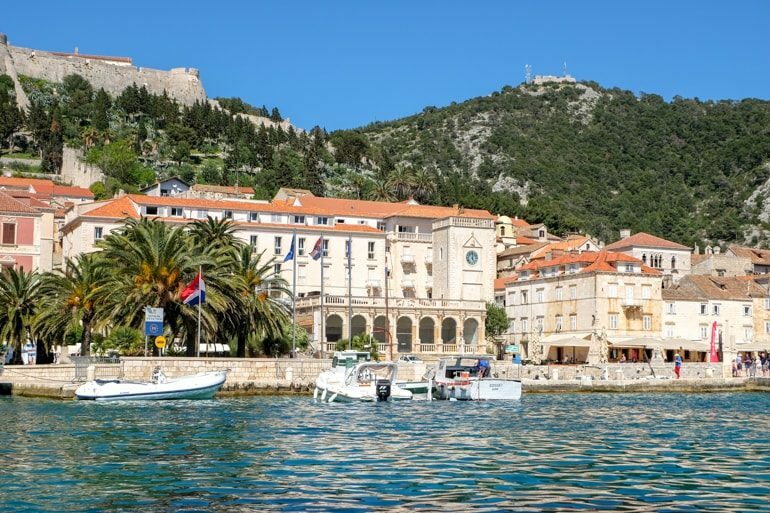 We wanted to visit Hvar as a top thing to do in Croatia but had a hard time figuring out the infrequent ferry schedules in the off-season (it was March/April). We decided that to see the islands on a day trip, we would spend the money on a Croatian 5 Island Hopping Tour. We booked it through Get Your Guide, paid our own money, and had an AMAZING day seeing 5 islands. If you want to read about the whole day, see the photos, and watch the video we made, you can check out our post on the day we Island Hopped in Croatia! That said, finding a place to stay in Hvar might be difficult depending on the season you are looking to travel in. In the off-season from September to April there are likely to be places available if you had to book last minute. In the summer season, you better book your accommodation in advance because the best places fill up, the terrible places fill up, basically everywhere fills up! 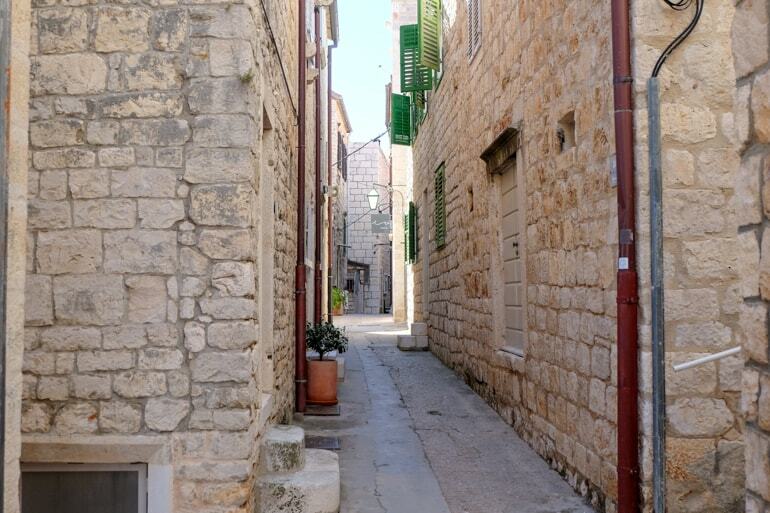 The streets and narrow alleyways in Hvar lead you to places you didn’t know you were going. If you’re on the island of Hvar and you’re in the city of Hvar, it’s enough to simply wander around and take in the sights and sounds. This is especially true if you’re new to exploring the Balkans and Croatia, in general. You’ll find alleyways with coffee shops, stairs to restaurants, and pathways to shops, stalls, and even look out areas. You’ll pass door after door – these are people’s actual front doors – and can imagine what it’s like to live there. The entire country is a very special place and the opportunity to explore these cities for their simple beauty is something we think many people miss. 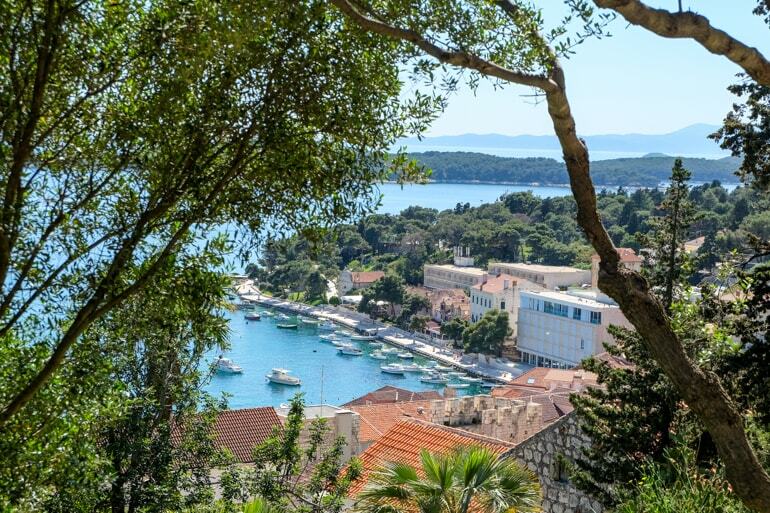 You can see the Spanish Fortress in the top left corner – peering down over Hvar! Also – the elegant Venetian Terrace at centre. If you’re in Hvar Town, you can’t miss the fortress-looking building sitting atop the hill. That’s the Spanish Fortress, and you can climb up there and pay to go inside! The current version was built in the 13th century and has been renovated and updated a few times since. The cost to enter was 40 kuna. 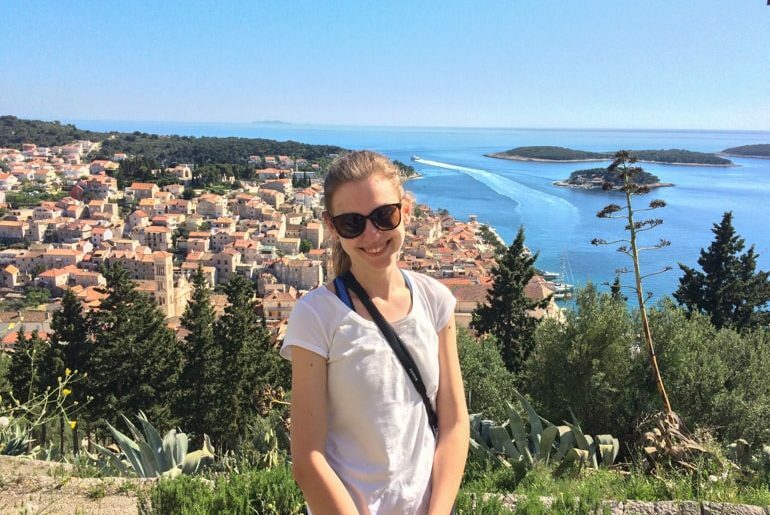 The views of Hvar Town from the hike up are beautiful enough! We opted not to pay to go inside and explore the towers because the view we got of Hvar from the walking paths on the way up was beautiful enough. Also, we didn’t want to run out of time because we had to get back to the boat. We know people who did go up to the top of the Fortress walls and get the highest vantage point of the surrounding area. They said it was gorgeous – and we believed them! You can read more reviews about the Spanish Fortica on TripAdvisor. Lisa enjoying the beautiful view. The old bell tower of St. Mark’s Church stands out among the landscape. Built back in the 16th century, the church was formerly used by the Dominican Monastery. Today, the ruins are an archaeological delight of sculptures and old tombs. In recent years, weddings have been held at the venue but we’re unsure whether that’s still an option as there were renovations completed a few years back. In any case, the bell tower can be seen from any points in the city and it makes for a gorgeous photo. We didn’t get the chance to wander too close but got this photograph and stood in awe at how pretty it was. We had a crumble-type cake with a raspberry sauce and it was AMAZING. We stumbled upon Nonica by accident – and we are SO glad we stopped in! Nonica is local dialect for “Grandma” and their bakery is inspired by old recipes. 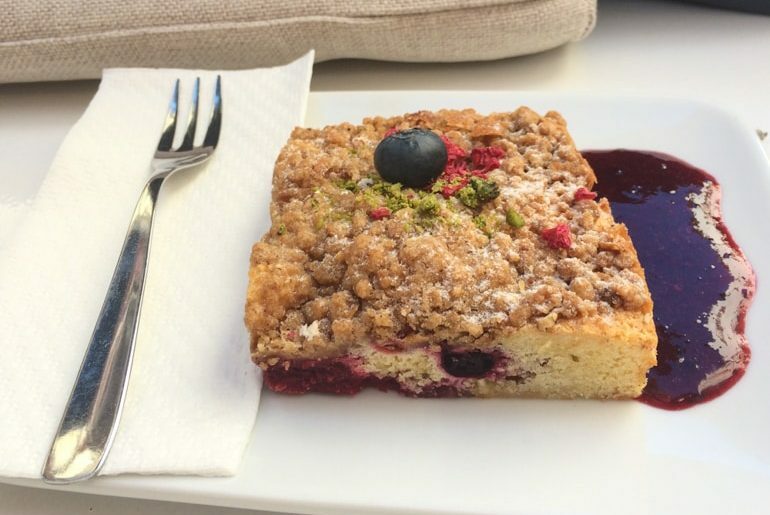 It’s s small cafe – but they have made their presence known in Hvar. Inside, you find a glass case full of amazing looking desserts. The cake was delicious and the coffee and water were great as well! The alleyway out front is lined with benches with white cushions and little tables to relax and enjoy your sweet treat out of the sunshine. It was exactly what we needed after a long day in the sun. When we went, they were cash only so keep that in mind – their website also says that! If you want to check out their website, you can do so by clicking here. If you’re in Hvar, go to Nonica. Just – trust us. 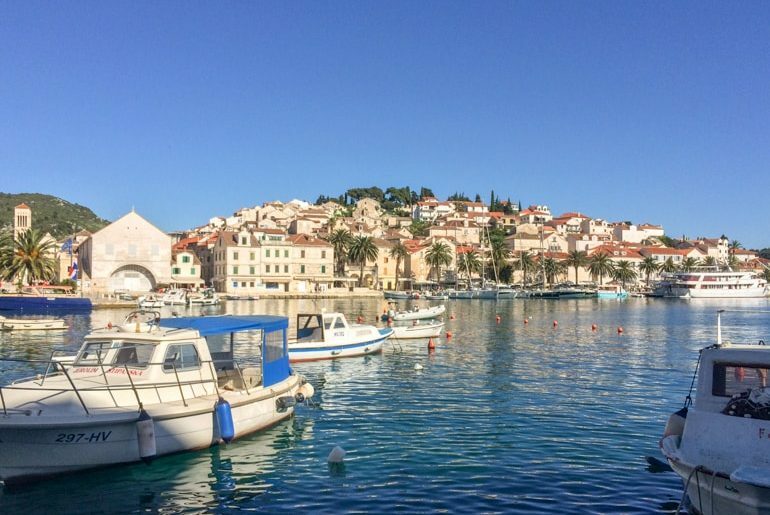 If you walk from the harbour to the east, you can’t miss the openness where the downtown becomes Hvarska pjaca or Plaza Hvar. Lining the Plaza are many cafes and restaurants with lots and lots of seating facing the Plaza and the sea. It’s a perfect, sunny place to enjoy a coffee and have a rest. If you’re into people watching, then you can also do that here! There would sure be lots of tourist and locals to look at! One of the best cafes is Caffe Bar Pjaca. With nice coffee and even desserts and real food, you can’t beat the location. The bell tower and the Cathedral at the end of the Plaza. If you’re sitting in the plaza, there is no way you’ll miss the beautiful looking cathedral that is standing proudly at the end of the Square. This is St.Stephen’s Cathedral. Built in the 16th and 17th century, this smaller cathedral is named after – you guessed it – St. Stephen! If you catch the cathedral while it’s open, it’s 10 kuna to enter. Shoulders must be covered, however, we read on TripAdvisor that they offered a woman shawl to cover upon entry. The cathedral itself is small but beautiful. You can even attend a mass entirely (in Croatian) if there’s space and you are on time! There is even a museum right beside – Episcopal Palace that is open daily and features artifacts, literature, and other pieces of Croatian history. Fishing boats are always floating on the ready in Hvar. We ate seafood a few times while in the Balkans and the Adriatic Sea provides you with some tasty, fresh options! For seafood in Hvar, you could try Macondo for a nice seafood dinner. Check out the reviews on TripAdvisor to see for yourself! Another option is Konoba Menego. Located in the side alleys between the harbour and the fortress, Menego specialized in Mediterranean dishes. If you’re a fan of olives, this is the place for you! It’s so secret that Hvar has a lively nightlife scene. From posh clubs and terraces to bars with cheap shots and beer, there’s something for everyone trying to enjoy their evening out. Because we didn’t spend a night on Hvar, we didn’t experience this firsthand but we know friends who have. They said their evening was full of drinks, laughs, and generally paradise-fueled shenanigans. We’ve read quite a few posts that say that while there are lots of good places to go out, many places packed and overpriced – essentially making you pay for the experience and not the quality of cocktail or crowd. For a romantic evening out, consider booking a table at the San Marco Restaurant & Lounge and their famously elegant Venetian Terrace. You can’t miss the clock tower in our photo above – it’s the one that overlooks the harbour. This is west of the harbour – towards the clubs bars mentioned below! There are lots of places with patios and music lining the pedestrian walkway on the east side of the harbour. However, if you walk to the west side of the harbour, you’ll find more of the most popular/famous of the clubs and restaurants. In order of closeness from the centre, you’ll find Veneranda, Bonj Le Bain Beach Bar, Hula Hula, and Falko. Again, we’ve never been to any of these – but there are the most talked about so check out the reviews and decide for yourself! The smaller islands that also make the area around Hvar are numerous and exploring them all might take a little bit of planning. There are lots of beaches on other coves, restaurants that you must boat to, and, in general, other beautiful spots you should check out. Overall, with such a connection to the sea exploring the water in the area is a great way to understand the rich history of the region. To explore the Pakleni Islands (the islands just across from Hvar harbour), you have a few options. You can rent a kayak and hop on a guided tour to discover all the best spots along the Adriatic Coast near Hvar. You might even charter a boat yourself to explore other areas. Below, you’ll find a variety of activities that might suit your explorer interests! Hvar, the island, is full of other little adventures. The island is known for many things – including lavender fields! Hvar is also known as one of the two main wine-making regions in Croatia. So, if you’re a wine lover, definitely take advantage of the fact. The climate of the island is what makes the growth of so many different and unique plants (and their products) possible. On the other side of Hvar (the town), is Stari Grad. 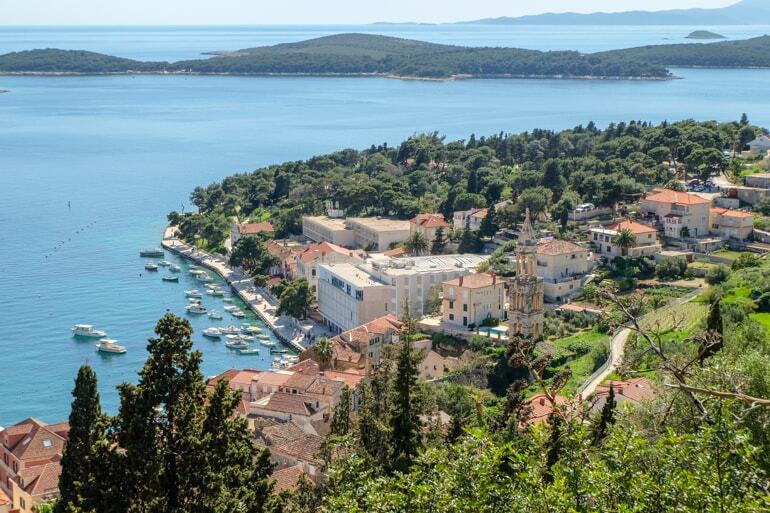 Stari Grad is one of the oldest towns in Europe with seaside houses and green areas surrounding the harbour. Located on the other side of the island of Hvar, the town is known for its beautiful buildings and harbour area that feels like it is straight out of a time capsule. You can drive there in a car in about 25 minutes or you can take a semi-frequent bus. The schedule from Hvar Town to Stari Grad is here if you need it! 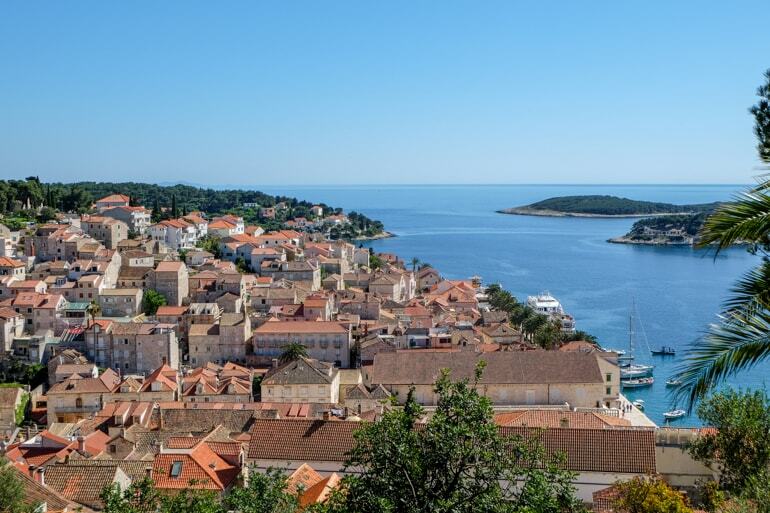 And there you have it – some of the best things to do in Hvar! Honestly, it was a neat little seaport but we wouldn’t rush back. We also weren’t clubbing or there with lots of friends so we are sure that the experience is far different than from ours. We’re glad we stopped in to see it, glad we went island hopping, and glad we got to spend so much time in Croatia. 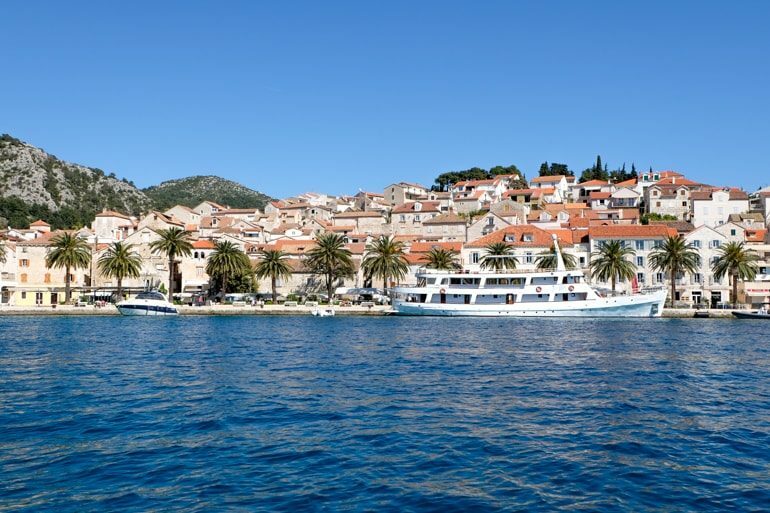 Have you been to Hvar? Let us know what you think!